Since moving back to Laredo, I've beenntrying to get involved in the art community more. At first it was kind of rocky but now I feel pretty comfortable to the point where I'm going to shows by myself, meeting new folks, and being highly aware of all the cool art things going on around town. 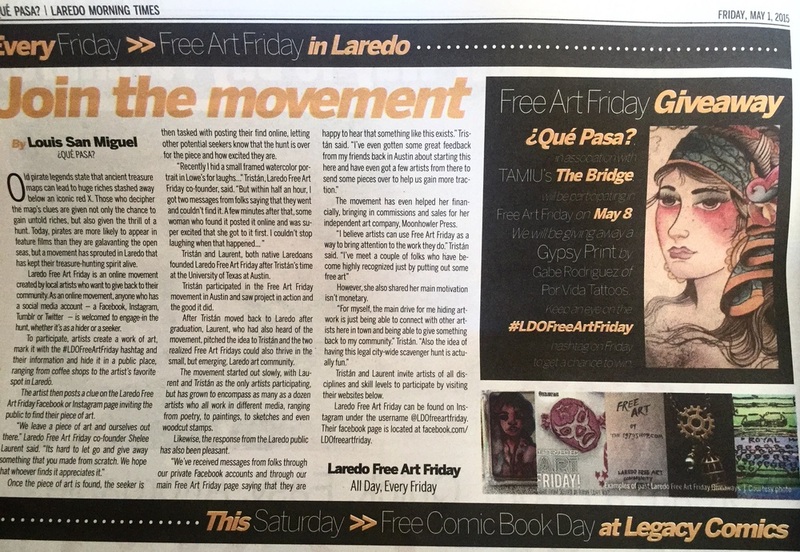 One awesome thing that has been happening is Laredo Free Art Friday. My artist friend Shellee Laurent had made a post about Free Art Friday sometime back in January. We talked about it for a bit and she suggested we start it up a group for it. Now we have a Facebook page and having been getting a lot of positive feedback. My friend Louis San Miguel wrote an awesome article about us and it came out in the local paper today. I woke up this morning to a bunch of messages about it. So it's been pretty exciting! I have bittersweet feelings about my hometown. I love it because it is home. But sometimes it's hard for people to want to change around here. So far all of this have been a positive experience and I am so grateful for that. Hopefully we'll be able to do more creative things with Laredo Free Art Friday. I am looking forward to the future.